Happy Thursday, hope you've been having a good week. It's been quiet around our house, since the boys went back to school on Tuesday, even though they won't admit it, I think they're happy to be back! Today Kerry issued the following 3CTC - Trains, planes, and automobiles! A card with some kind of powered vehicle. I don't think Stampin' Up! has many images left like this in the catalog - so I reached for Route 66 from Artistic Outpost, I just *love* the images on this plate. The motorcycle is stamped in Black Archival on White card stock. I used a SAMJ to add the sentiment in Ruby. The background was created using the Depth of Field Technique in the following inks: Going Grey, Ruby Red, Black. All white edges where sponged in Grey ink. Thanks for stopping by, be sure to click on the Three Clovers Logo on my sidebar to see what Kerry and the other challenge members created today. Love this card! Although I'm not a big motorcycle fan, you really used images and color to make a stunning presentation. Is the depth of field technique a tj one? I'm just recently back and haven't really gotten up to speed. I will explore the techniques and see if I can find it. Your card has inspired me to try this technique. Nice job! Yes, the Depth of Field is a TJNL technique. I'm glad I could be of inspiration! Fantastic card. Love how you created your background and what great image. My hubby would of course love this card. Oh this is just so very fun, Lisa!! 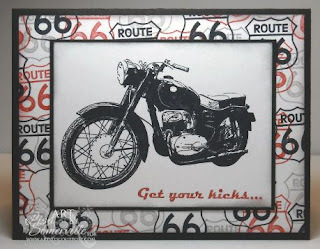 Love the sentiment with the route 66 background! What a totally awesome card!